Ending absolute poverty has been a Holy Grail for development economists, and many others, for the past half century. However, it has been difficult to identify specific policy programs which governments can pursue to end human poverty. One policy program which some development researchers believe would contribute greatly to ending global poverty is more liberal migration laws allowing greater freedom of movement across international borders. There is a place premium: The same person, without any change in skills or in the number of hours worked, can earn a considerably higher income in some countries than in others. Thus, migration is almost a “free lunch” for these workers and the richer economies they can work in. The causes for the place premium are complex, but they are believed to be some combination of economic systems, legal systems, and culture/social structure than enable better use of a person’s talents. A significant fraction of people from poor countries have escaped poverty through migration. For instance, among those born in Haiti who are today not in poverty, 82% escaped poverty by leaving Haiti. For more on this research by Michael Clemens and others at the Center for Global Development, see the income per natural page and the linked research. When there is freedom of movement between countries, there is rapid convergence between the incomes earned by people in comparable jobs. Migration plays an important role in this, both directly and via remittances and by creating a more interconnected world. 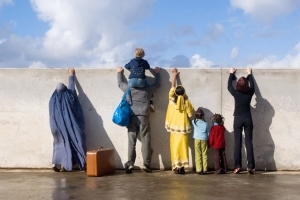 The image featured at the top of this page depicts people reaching over a wall barring them from migrating, and was created by the European Commission.